The feast of Christmas is the feast of the mystical Body, for it is through the Incarnation that men have become members of Christ. Whatever theological interpretation we give to this great scriptural and patristic affirmation of our incorporation into Christ, we must believe that with the Incarnation, an ineffable union – that passes all understanding – began, in human flesh, between Jesus Christ and men. 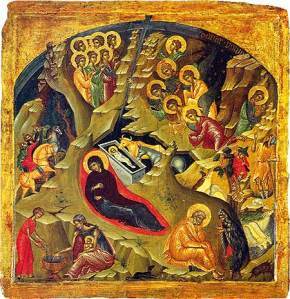 Beyond the particular historical event which took place at Bethlehem and through which the Son of God took on a visible human body, another event took place that concerns the whole of the human race: God, in becoming incarnate, in some way weds and assumes the human nature which we all share and creates between himself and us a relationship which, without ever ceasing to be that between the Creator and his creature, is also that between the body and its members. There is union without confusion. Christmas allows us to become most deeply conscious of what is our true nature, human nature, regenerated by Jesus Christ. – Father Lev Gillet, The Year of Grace of the Lord: A Scriptural and Liturgical Commentary on the Calendar of the Orthodox Church, 70-71. Merry Christmas from your friends @ http://www.zazenlife.com ! Union without confusion. I like that! but it also resides within the framework of our heavenly Father. Yes, distinct but not separate. Our identity is not lost but on the contrary more authentic.